In university shake-up of the 60s, an old professor is implicated in a confusing incident that provokes his exile. The reconstruction of his adventure sheds light on the unexplained disappearance of a student. Up until now he seemed a mere portrait of the Franco repression. But the testimony of the repressed, the oppressors, the victims and the beneficiaries of the regime, in constant dialogue with the reader –and with the author himself– places controversy over memory in an unusual situation: the memory isn’t the question, but the only valid answer. 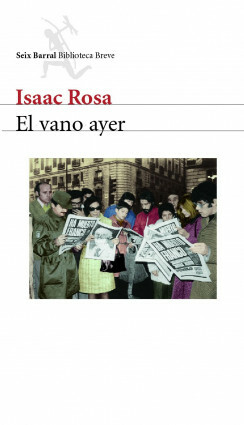 El vano ayer is very far from being just another novel about Spain’s recent past. It’s an original approximation of the Francoist consequences that are still in force, and goes against the frequent literary success of preconceived schemes. Surprising and changeable, imagine a call of attention to the traps of a sentimental and decorative memory that results in something near to nostalgia while at the same time annulling the responsibility and suffering. Premio Ojo Crítico, Premio de la Crítica and Premio Rómulo Gallegos 2005. By way of the formula introduced, and using an irony that enhances the most tragic aspects of the narrative, Isaac Rosa explains the foundations and mechanisms of the novel so that the reader will be aware of certain illusions –none innocent– and decide if he or she wants to succumb to them. Christian Bourgois (France), Frankfurter Verlagsanstalt (Germany), Gran Vía Edizioni (Italy), Polis (Greece). Another Damm Novel about the Spanish Civil War!